This is the Sensei's Library bus stop. Sensei's Library is about the oldest and (for some people) most fascinating board game in the world: Go. "Just one game" they said and began to play. ... anytime you're ready to leave. See TourBusMap for a list of all bus routes. 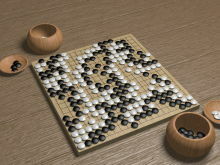 Learn everything about the game, starting from what is Go, its basic rules, life and death, shape and thickness, to more advanced strategic concepts. You can also test your new skills at Beginner Exercises afterwards. definitions and proverbs for just about every situation you encounter on the board. From basic terms like sente, gote, atari, to common ones like tesuji, joseki, and fuseki, to the obscure ones like katteyomi, kami-no-itte, and me-ari-me-nashi. learn the "do"s and "don't"s of Go. From The Art of Resignation to "Nuclear Tesuji". Here you find an answer to just about every topic you can think about. From plays in the corner to shapes and connections, from Go history to Go humour. If you just want to sample the site, try taking one of our Guided Tours. Some practical advice and information may be found at Go servers and buying equipment; the studious can consult go books. The link collection will help you explore go sites on the Web, though the coverage here is extensive too. For more Go-related Wikiwiki sites, look at GoWikiWiki. In case of questions or problems contact the Bus Management.